I’ve edited the Pattern Library page and put a bunch of new patterns on there along with a PDF that contains all the patterns in the one file. On the second Pic with the Celtic braid what is the purpose of the sticks? And correct me if I am wrong but you have each cards set of thread tied individually on the dowel? Thanks A new Card Weaving enthusiast. Do you mean the second pic on Flickr? They’re bamboo skewers used in place of weft yarn so I can test a new pattern or experiment with variations and be able to easily undo anything that doesn’t work. I’d worked out the pattern for that braid by reverse engineering from a photo, so there were a few errors in threading and turning sequence before I got it right! I tie off each card individually for a combination of reasons – more control over tension, ease of correcting threading errors and I find it less fiddly during the warping up process as there’s no risk of warps coming unthreaded once they’re done. But it’s very much a personal preference thing, tying them all in one bunch works just fine too. i just wanted to let you know that i’ve used your ram’s horn pattern to make my second ever tablet weave. 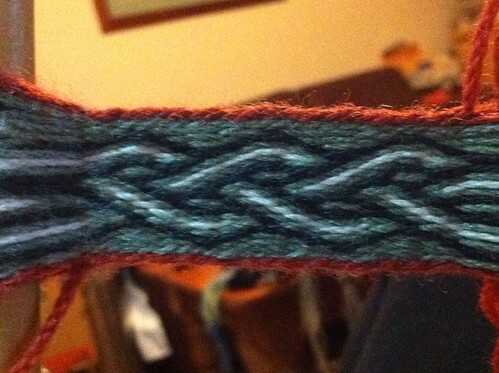 my first was just a little 8-card chevron sampler that i only got to bracelet length before finishing off. i really appreciated your how-to and posting of patterns! i couldn’t find that ram’s horn pattern anywhere else, even though there are photos of the work it creates all over the place. and sent some folks to your site this morning, as i’ve had a handful of friends on instagram curious to learn (i shared a video of me weaving this pattern) and one guy wanted to try out the same pattern. thanks again!! 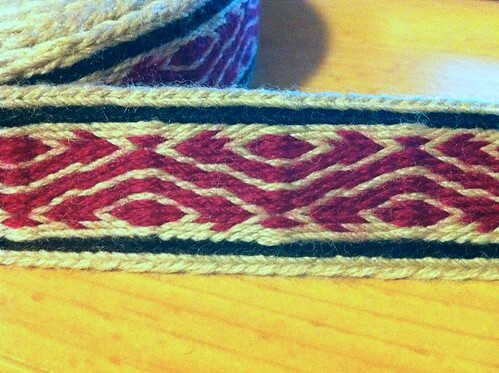 i look forward to the delicious process of finishing up my first full belt and then deciding what pattern to try next. I’am discovering tablet weaving and I’am delighted;could anybody give a clue to gunrtam’s explanations for his pattern weavings it looks so fantastic.Your site Mim’s is absolutely”genial”,thank you! Hi 🙂 Splendid page with splendid patterns. 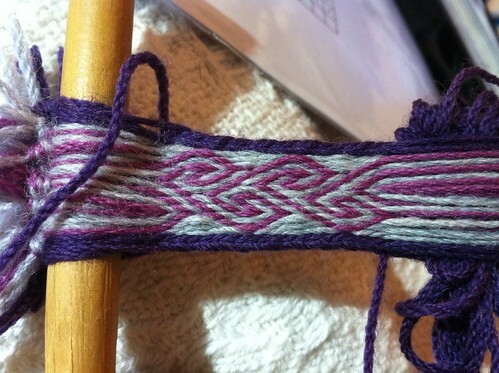 I am an absolute beginner and made my very first tablet weaved band yesterday. Reading through your wonderful patterns I want to try out the braided shadow weave pattern, but no matter how much googling I do I can´t figure out that twist part. What does it mean “start with 9 and 10 twisted. 2 F then twist 7,8,11,12 and so on”. What does it mean? Twist the card so it goes from S to Z or Z to S? Which way to twist (left or right), and do one twist the same way each time? I hope you have time to clearify this for me. Kind regards, Mette. Hi Mette, the written instructions for the turning sequence are just another way of describing the instructions set out in the grid version. You can just ignore them and follow the forward and backward turns laid out in the gird instead. ” A backwards turn is identical to a forwards turn of a tablet that has been flipped or twisted. More complex turning sequences are given both as a grid showing which cards need to turn in which direction and as a simplified sequence that uses twisted cards to replace the backwards turns. I am jazzed about finding your website! My 29 years old son loves all things handmade so I asked him if he would like a belt tablet woven. He is so stoked! Just need to figure how to finish the ends…D rings?, metal tip for the other end?